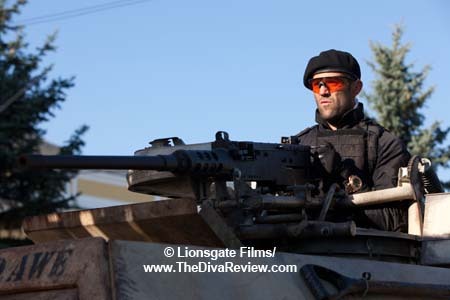 One might reckon in the terse summer days of 2012 when due to tragic and insane all-too-real events it might seem like not such a good idea to glorify guns and other killing machines on the big screen. It would take a film so far removed from the realm of possibility that it could suspend any likelihood that the public might relate it to the real world. 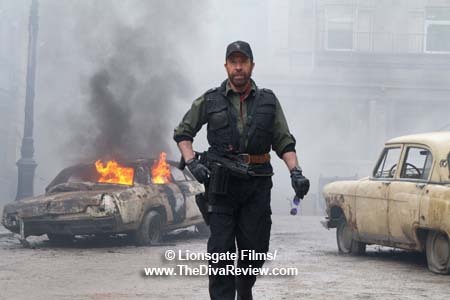 That complete separation comes in the form of the way over-the-top bombast and the pure, visceral escapism and laughs heaped on to the audience in spades in The Expendables 2. General Douglas MacArthur famously said, “Old soldiers never die, they just fade away.” I guess the same doesn’t quite apply to soldiers of fortune. Barney Ross’ merry band of mercenaries is not only showing any sign of slowing down, but are injecting new blood into their veins with the recruitment of a skillful young sniper fresh from the sands of Afghanistan. Unfortunately, the ragtag crew has some unfinished business left over from their last adventure and their mysterious mission broker, Mr. Church means to collect on loose ends. Choosing to undertake a mission in Eastern Europe to retrieve a computer program the government wants and saddled with the unthinkable -- a woman -- the bohunks and the female agent discover that they are not the only ones looking for this particular apparatus. A shady bad guy with real thing about disrespect, practically owns the town the team have infiltrated. He has pressed every available body in the citizenry to work mining plutonium, which along with the program will make him much richer. He just needs Barney and his pesky pals out of the way. 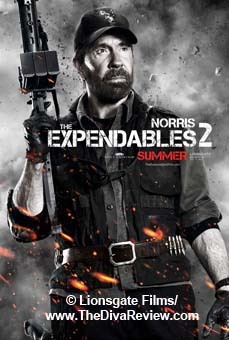 There was early word that The Expendables 2 was going to be hobbled by the requirement by one of its stars that the film be kept to a PG-13-level of violence. I’m very happy to say that it was only a rumour. The amount of flying bullets, rockets launched, explosions, splatters of obviously-CGI blood and joyfully relentless nihilism is well into R-rated territory. What’s wise about the way all that boom-crash and destruction is handled is that it’s so over-the-top that it plays like a live-action comic book and has no basis in reality, whatsoever. 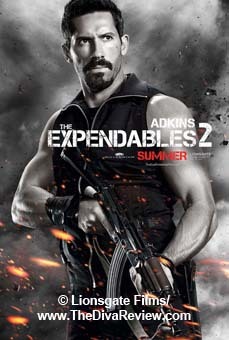 This would also describe the levels of acting by The Expendables 2’s multigenerational cadre of action stars. 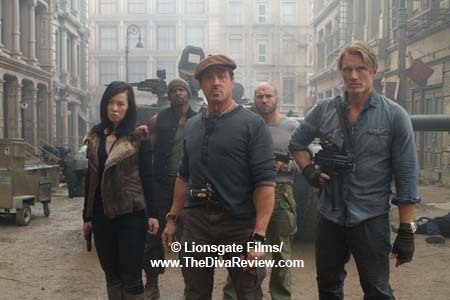 Sylvester Stallone (Who directed the first film, but hands the reins over to Con-Air’s Simon West) makes a game but feckless attempt to bring depth to Barney, a man very good at what he does, but questions why he still does it and if it’s worth the personal sacrifices for himself and his band of misfits that seem unsuited to do anything else. 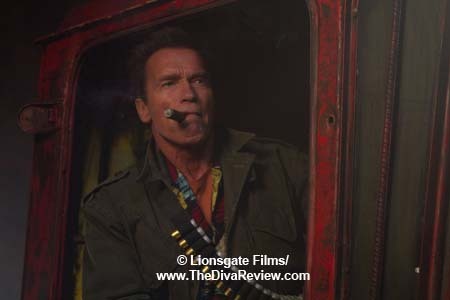 The only gravitas in the last film came from Mickey Rourke’s strangely mesmerising, free-association philosophical solo riff, and as he’s not in this new movie, any attempt at profundity should await his return to the franchise. 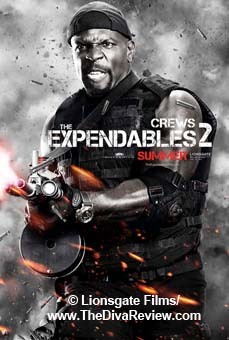 The other Expendables’ performances vary from trying to play it fairly straight, to offhand, barely-there efforts, to giddy scenery chomping -- I’m looking at you, Terry Crews. Crews injects a lot of life -- and huge biceps -- into the proceedings. 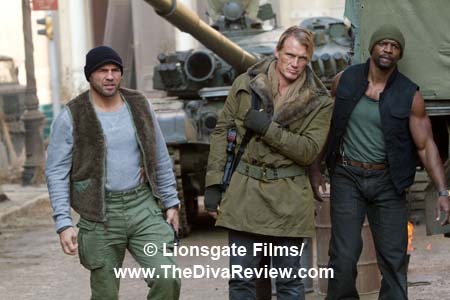 Dolph Lundgren who was a bizarre trip in film one, returns as the addle-pated mercenary, who, we are informed, like the actor himself, was actually awarded a Fulbright scholarship to the prestigious Massachusetts Institute of Technology. 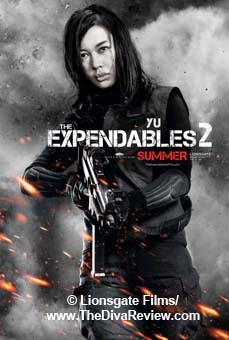 Intellectual bona fides are no help to the Frankenstein-ish giant and his awkward passes and doofy goo-goo eyes don’t work on the shapely new lady Expendable. 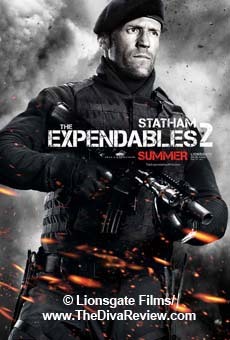 Jason Statham gets his Transporter-esque martial arts sequence, and he, like the rest of the cast seems to be in it for a good time -- and the sequel cash. There are expansions of some of the cameos seen in the previous film and the addition of a new old salt whose entrance, inexplicably scored to Ennio Morricone’s immortal theme to The Good, the Bad and the Ugly, will have action fans howling with laughter and nostalgic delight. 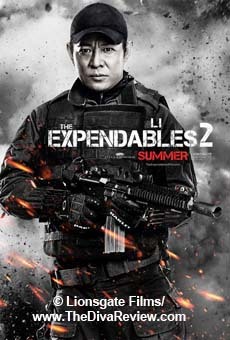 Disappointingly, Jet Li is only in the movie for a hot wuxia-packed minute before disappearing somewhere in China, claiming retirement, and apparently, spunky new addition Liam Hemsworth had to rush back to the next Hunger Games film to tarry too long here. 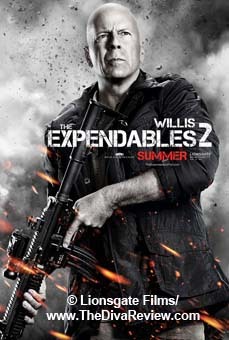 Arnold Schwarzenegger and Bruce Willis reprise their bit roles from the last movie with more screen time, but most of their spoken moments are spent in awkward self-homage, trading their old tag lines back and forth. Governor, enough with the “I’ll be back.” Really. The dialogue is so predictably awful and clumsy it adds to the humour, though I’m guessing not entirely intentionally. For example, I’m not sure Stallone’s heartfelt speech at the gravesite of a fallen comrade was meant to bring hoots of laughter from the audience. Eh, who cares? 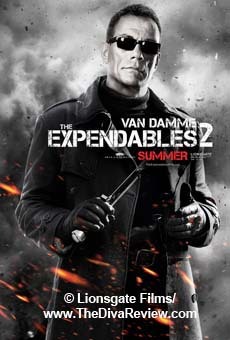 Once you realise you’re watching a cavernous-cheekboned Jean-Claude Van Damme as a Pepe Le Pew-accented villain named Vilain -- seriously -- you know the script wasn’t written by David Mamet. 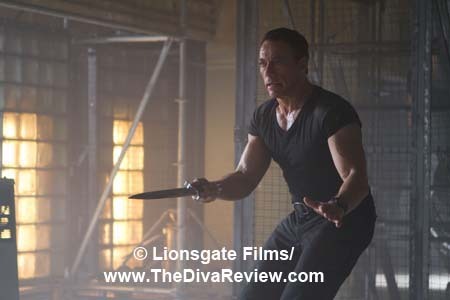 One small spoiler for a missed opportunity in all the self-reverential riffing between the action stars, is that nobody thought to put Van Damme and Lundgren in a scene together as a look back to their very good 1992 collaboration, Universal Soldier. I guess they needed the time for yet another “I’ll be back” variation. 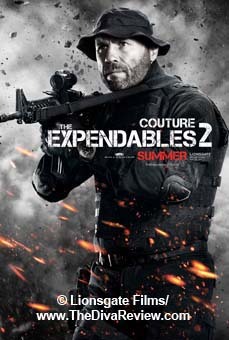 Self-homages aside, what everyone who comes to The Expendables 2 will enjoy is the all-out firepower used as frequently and dramatically as possible; starting with The Expendables’ version of the Batmobile, an all-armoured vehicle that looks like a cross between a battleship and something out of the Road Warrior. Every conceivable firearm is employed from handguns to rocket launchers, setting off beautiful pyrotechnics in the wake of their destruction. The hand-to-hand combat is also well choreographed. 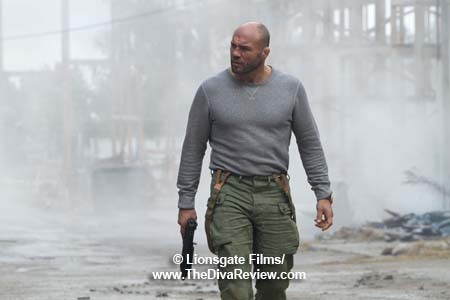 To that end, I thought it was an odd choice to make almost no use of their resident MMA champ, Randy Couture. Also, the big Stallone/Van Damme face-off seemed ill-conceived, watching the lithe and limber Belgian whip out his signature high kicks against Rocky’s straightforward haymakers, but hey, Sly’s the hero and we’re all about suspension of disbelief here. There’s so much wanton destruction to choose from, these vagaries in the action are easy to dismiss. 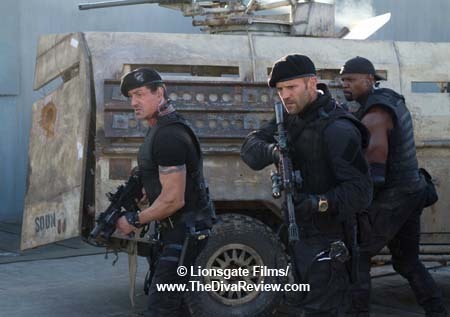 Expected trifles aside, The Expendables 2 captures all the guilt-free pleasure of the genre that made these action stars famous, but updates for today’s seen-it-all audiences. The film revels in the pure, visceral enjoyment of watching stuff blow up on a really big screen and rampant destruction where nobody really gets hurt. 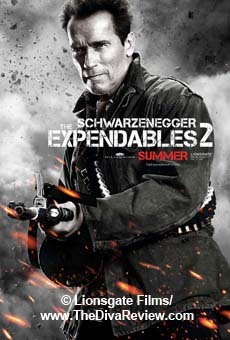 So leave your brain at the door and dig The Expendables 2 for the bombastic blast it is.